Apparently I have this thing with salads. When we go out to eat, I order salad. It’s the middle of Winter, half the country was covered in snow last week and I’m sharing a recipe for salad. In my brain, there’s no such thing as a “salad recipe”, which makes today’s post stranger than it already feels. I’m very much so the toss-it-in, see-what-else-it-needs and like-it-or-make-dinner-yourself kinda gal. 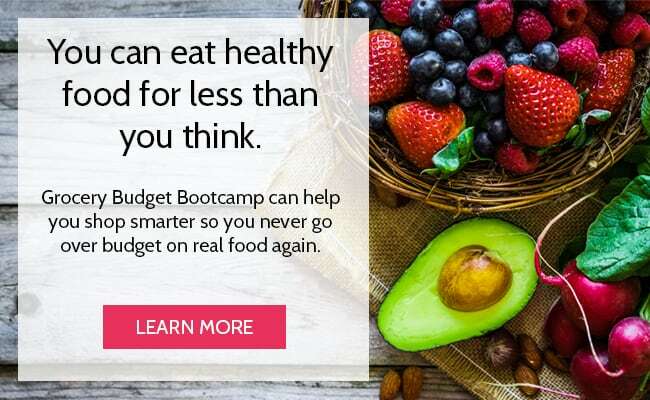 But as I read through the feedback on our meal planning membership, there are a lot of you who need recipes – even the small ones that I often take for granted! So I dedicate today’s post to all those who need recipes. Who appreciate recipes. Who don’t want to mess around with experimenting and substitutions and such and just want to make it right the first time. Honestly, I don’t blame you. 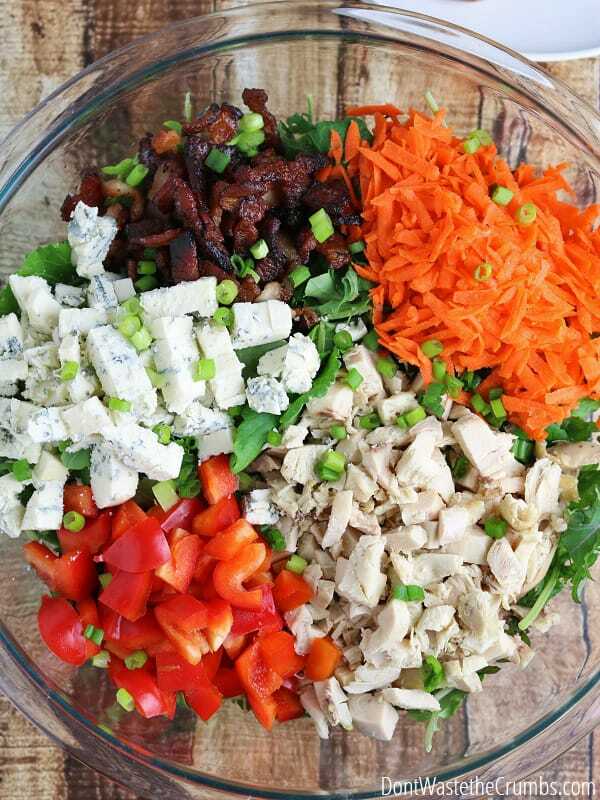 Allow me to share with you the official recipe for one of the best salads you’ll ever make: Buffalo Chicken Bacon Ranch Salad. Let’s start off by talking about the two things that make this buffalo chicken bacon ranch salad absolutely amazing: Buffalo sauce and bacon. Buffalo sauce is my all-time favorite sauce ever, and it just so happens to be one of the few sauces that don’t contain fake ingredients or weird additives that can cause allergy-like reactions (yes, I’m talking to you MSG). We’re not brand-loyal, but actually prefer store-brand over the popular name brand. 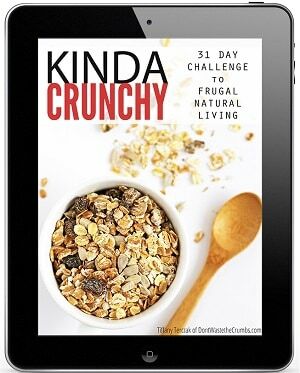 Just pick up whatever is your favorite and affordable or use this recipe to make your own. Bacon is… well, bacon is just awesome. Does this need a discussion? I didn’t think so. Alrighty then, moving on. Next up is color and crunch. See those carrots? They totally jazz up the color of this salad and make it incredibly vibrant. Plus they’re a vegetable. Not that a salad technically isn’t a vegetable by definition, but hey, bonus points for adding some orange to the mix. About those bell peppers… I know they’re not in season for most of the country, but I found them on sale a few weeks ago and I couldn’t resist. They’re sweet, crunchy and taste amazing in almost everything, but they’re especially delicious in this salad. And they’re red, which is kinda cool in a salad too. Finally, we’re taking this salad WAY BEYOND awesome by adding cheese. But not just any cheese. Wait – you thought I was going to say blue cheese? No way Jose! Swapping Gorgonzola for blue is one way we save on cheese, and when you’re mixing it up with a bunch of other yum-o items, you can’t even tell the difference. I save dollars. You enjoy dinner. Win-win. 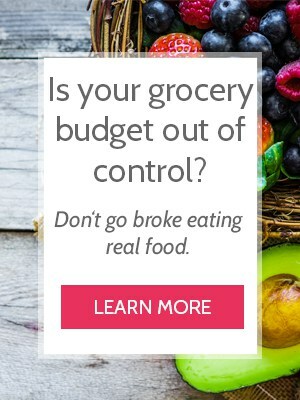 Now, here’s a secret that I’ll share just with you, my frugal foodie friends… because truly, only you guys will understand. 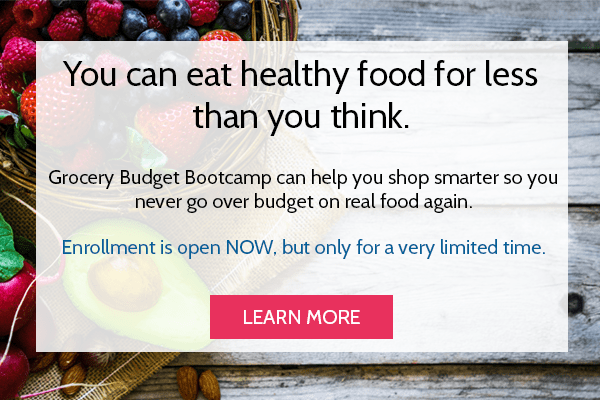 All those magnificent, colorful, healthy and crunchy toppings? There’s no more than 1 cup of each! One of the keys to enjoying fun things like bacon, chicken and cheese on a salad is by keeping the portion control, under control. When you have several toppings (there’s six in this salad, including the green onions), a little bit of each really goes a long way. Add any more than a cup and you’ll be taking bites wondering if there’s any lettuce in that salad after all. Unless you’re only eating bacon, of course. Combine salad ingredients and toppings in a large bowl. Toss with ½ cup of homemade ranch dressing. Pass additional homemade ranch dressing at the table. Drizzle buffalo sauce on top of salad, as desired. 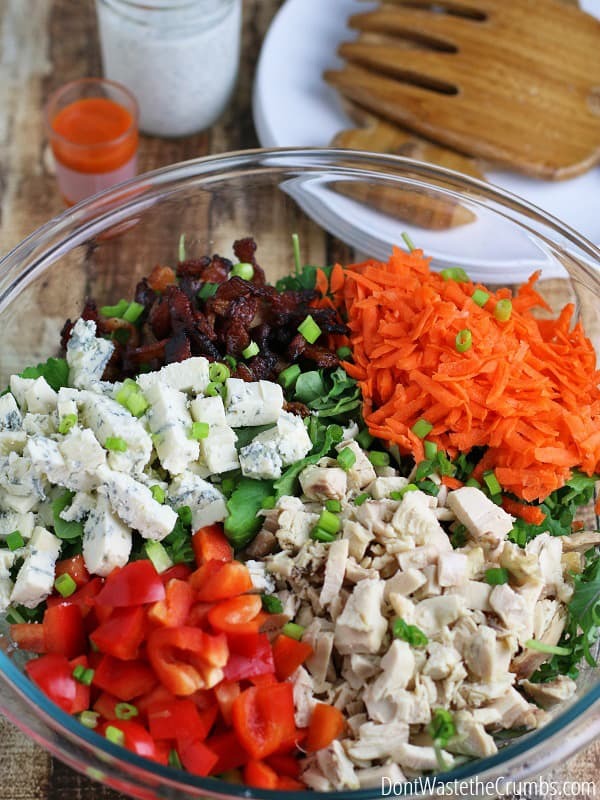 Enjoy this buffalo chicken bacon ranch salad! I wrote this recipe to accommodate families with kids who aren’t fans of spicy foods. If this doesn’t apply to you, toss the buffalo sauce directly in with the homemade ranch dressing and spice it up! You can’t tell by the picture, but the chicken in this recipe was actually leftover from a few different taco nights! When there’s leftover chicken at a meal, I dice it up and put it in a freezer-safe bag. I add to it when I can, and when there’s a full cup, I either make chicken and spinach enchiladas or this salad. We don’t have leftover bacon often, but you can still save up to $2 per pounds by buying “ends and pieces” instead of full strips! If you go this route, cook up the whole package and measure out 1/4 – 1/3 cup for this salad. Freeze the rest like the chicken for a different meal. Total cost for Buffalo Chicken and Bacon Ranch Salad is $6.55. We would typically serve dinner biscuits, or overnight artisan bread with this salad and call it a meal, and a frugal way to eat six different vegetables! What type of home chef are you – do you need a recipe? 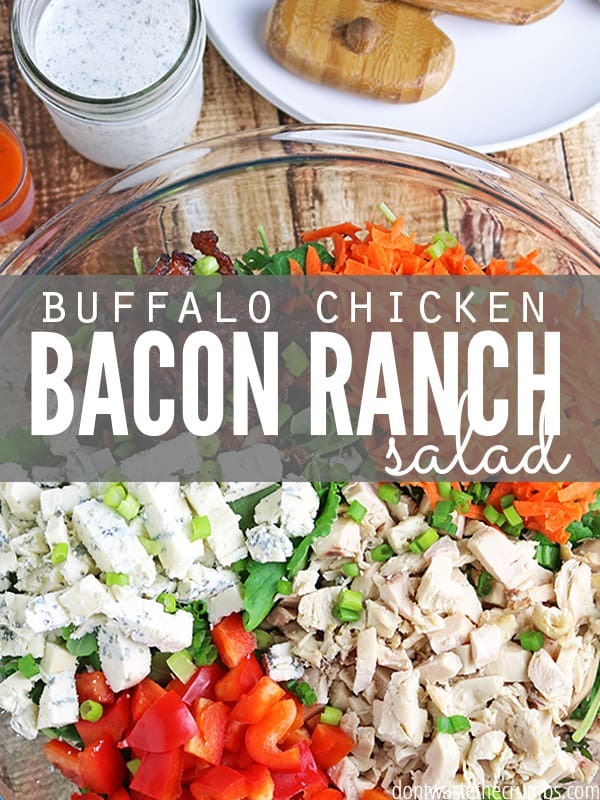 Do you have a favorite variation of this buffalo chicken bacon ranch salad? Or do you just wing it and hope it turns out? 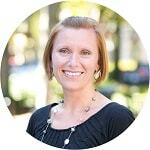 Guest Post: Healthy Chicken Salad, aka "Seed Salad"
This looks tasty! My husband & I love buffalo sauce, but it’s a little spicy for our kids, so this is a great recipe to please both, can’t wait to try it! Where do you find the ends & pieces packages of bacon? Thanks! 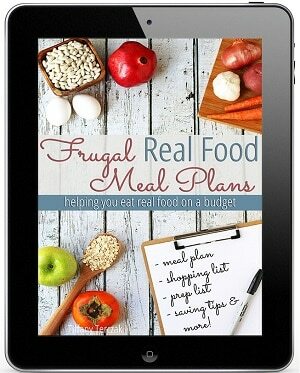 I love your beautiful & frugal recipes! I’ll substitute the Gorgonzola cheese in this recipe for Feta cheese, which we always have on hand for our family favorite, Greek salad w/ my homemade lemon/olive oil dressing. I buy the 24 oz pre crumbled container of President Feta cheese for around $5-7. One container lasts us approximately 2 weeks for a family of 4 adults & one teen. We eat salad several times per week (especially if I make jar salads), and it only takes a couple of tablespoons of Feta for lots of flavor. Thanks for your wonderful ideas & recipes 😊.